And for those of you who witnessed Kevin Youkilis reading the lineup, tell me he doesn’t look and sound like someone you’d meet online at 3am. Hey, Ed. If you do that to your ex-girlfriend you’ll end up with a paper requiring you stay 500 feet away at all times. Anyway, Howard Rubenstein announced the outcome of today’s proceedings, and it’s a doozy. So what’s in the box? NOTHING! ABSOLUTELY NOTHING! STUPID! YOU’RE SO STOO-PID! Hopefully at least one of you gets that. While the report about Don Mattingly’s supposedly not being ready to manage makes the rounds, Mattingly’s agent sees things a bit differently. Aware that such an equivocal statement from a potential managerial candidate could be career-threatening, Ed Schulte, Mattingly’s agent, said that The Star-Ledger’s report is completely false. Don Mattingly is ready and willing to manage the Yankees. I guess. Venezuela Winter League had no games scheduled. The Dominican Winter League season kicks off Wednesday, but the rosters haven’t been announced. I never really followed the league, so I don’t have any idea of what kind of players typically play there. I’m gonna guess that you’ll see names like Jesus Montero, Kelvin DeLeon, Abe Almonte & Jairo Heredia, but again, this is nothing more than a guess. Update: Now that I think about it, I remember hearing that Robbie Cano hit like, .380 in the DWL last year, so I guess the league does feature both big leaguers and prospects. We’ll find out in 24-hours anywho. In a piece about the imminent Yankee meetings in Tampa, Ed Price of The Star-Ledger dropped in an interesting tidbit about the recently-fired pitching coach Leo Mazzone. According to a source inside the Yankees’ camp, this week’s discussions will include a bit about Leo Mazzone. The Yanks were interested in Mazzone two years ago, and Mazzone’s manager has indicated that Leo is again interested in working for the Bombers. With a few young pitchers on the horizon, this is a match made in baseball heaven. As the Joe Torre Job Watch nears some sort of resolution, we’ve got some interesting developments courtesy of Ed Price from The Newark Star-Ledger. According to Price, Don Mattingly has told the Steinbrenner brothers — now in charge of the team — that he is not ready for the Yankees managerial post and does not feel comfortable replacing his current boss and mentor. The friend, who requested anonymity because the situation is unresolved, said he spoke directly with the former Yankees great in recent days. Mattingly’s stance could open the door for the Yankees to bring back Torre for a 13th season because he was the leading candidate for the job. The development comes as George Steinbrenner and his sons, Hank and Hal, convene an annual top-to-bottom review of the organization Tuesday. A Yankees official, who speaks often with top management, said Torre is a candidate for the job. The official, who asked not to be named because he is not authorized to speak for the owners, said the discussion was expected to center on who is the best man for the job as opposed to a referendum on Torre, whose contract is expiring. Now, as every Yankee blogger and their uncles are trying to find something, anything, new to write about concerning Joe Torre, this news, if true, is quite the curveball. First, much like we’ve done, the Yankees aren’t discussing Torre’s future in black and white terms. Rather, they are going to figure out which available target is the best man for the job. In other words, they will try to figure out who can handle up-and-coming young pitchers, who can best deal with the bullpen, who can best placate veterans sticking up for their current manager and who can deal with the scrutiny of managing the Yankees in New York. When all is said and done, can the Yankees braintrust really find someone better than Torre for the job right now? My money’s on no. At the same time comes the Mattingly bombshell. 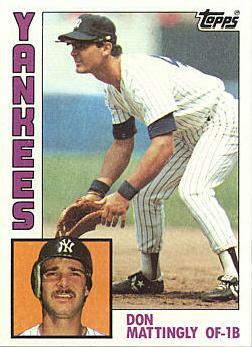 At the end of the playoffs, it seemed as though Donnie Baseball was gearing up to take the reins from Torre. He was deferential toward Torre, but at the same time, it seemed as though he anticipated being named manager sooner rather than later. I guess those writers speculating as such were reading Mattingly incorrectly. If Mattingly is hesitant about taking the job — and I think anyone with any sense of the situation would be hesitant to follow up Joe Torre coming off a 94-win season — the Yankees will not give it to him. That hesitancy would automatically make Mattingly the wrong guy for the job right now. This isn’t to say he won’t be the manager; it’s just to say that he won’t be the manager at the end of the day today. So as the Yankees brass gather in Tampa, we’re really no further along in this saga than we were on Friday. Joe Torre still seems like the best man for the job, and the number one candidate to replace him isn’t quite as interested as everyone figured. Yet.